Barton College, in partnership with the North Carolina Community Colleges, offers a Bachelor of Science in Nursing in which students can transfer seamlessly to Barton College to complete their degree upon receiving an Associate's Degree in Nursing (ADN). The baccalaureate program is approved by the North Carolina Board of Nursing and is accredited by the Commission on Collegiate Nursing Education (CCNE). The professional nursing courses in this program prepare graduates to function in present and emerging roles as collaborative members of multidisciplinary health care teams. The liberal arts, biological, physical, and social science courses taken prior to entry to the nursing courses provide a sound basis for scientific, humanistic nursing. The faculty of the School of Nursing are committed to assisting the adult learner in achieving his/her educational goals. An associate's degree in nursing from a regionally accredited institution. Must be a registered nurse with an unrestricted license to practice as a registered nurse. New graduates must complete licensure before NUR 319. All applicants to the Barton College School of Nursing must have a minimum grade point average of 2.0 on transfer coursework or Barton College coursework before taking NUR 305. CHE 200 is waived for the registered nurse student. If the registered nurse student has completed the requirement for statistics, the requirement for MTH 130 is waived. RN students will receive 35 semester hours of transfer credit based on the ADN courses. The RN-BSN completion program requires 35 semester hours over 2.5 semesters. Up to 6 semester hours can be taken in the term after the RN-BSN completion program. A minimum of 126 semester hours is required for graduation. Online students are required to have a reliable computer with reliable internet access, webcam, and microphone. Based on the evaluation of your official transcript, develop a plan for the completion of your prerequisite and core curriculum requirements. The program director will be available to help you plan your course of study. Keep the School of Nursing advised of your progress toward completion of your prerequisite and core curriculum requirements. Rolling admission with multiple entry points. Apply for the next cohort at www.barton.edu/apply. Select two from either category or one from each: ECO 251, ECO 252, POL 120. Suggested electives include but are not limited to foreign language, speech, culture, and computer science. Electives must be selected from the Transfer Course List in the Comprehensive Articulation Agreement. 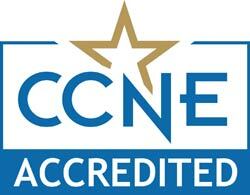 The baccalaureate and master's degrees in nursing at Barton College are accredited by the Commission on Collegiate Nursing Education, 655 K St. NW, Suite 750, Washington, DC 20001, 202-887-6791.